© Get Permissions Audience: Recommended for use by practitioners and peer leaders facilitating the process Assessing and Developing Readiness for individuals and groups. This compendium (on CD) is a collection of activities for assessing and developing a person’s desire to participate in rehabilitation services. It was designed for use with persons with long-term psychiatric disabilities in psychiatric centers or outpatient settings (e.g., continuing day treatment and intensive psychiatric rehabilitation treatment programs). It was developed from activities designed by the psychiatric rehabilitation teams in the New York State psychiatric centers following a five-year transformation process undertaken by the New York State Office of Mental Health to infuse their mental health system with the philosophy and technology of psychiatric rehabilitation. Each activity is outlined in a step-by-step fashion. Citation: Cohen, M., & Mynks, D. (Eds). (1993). 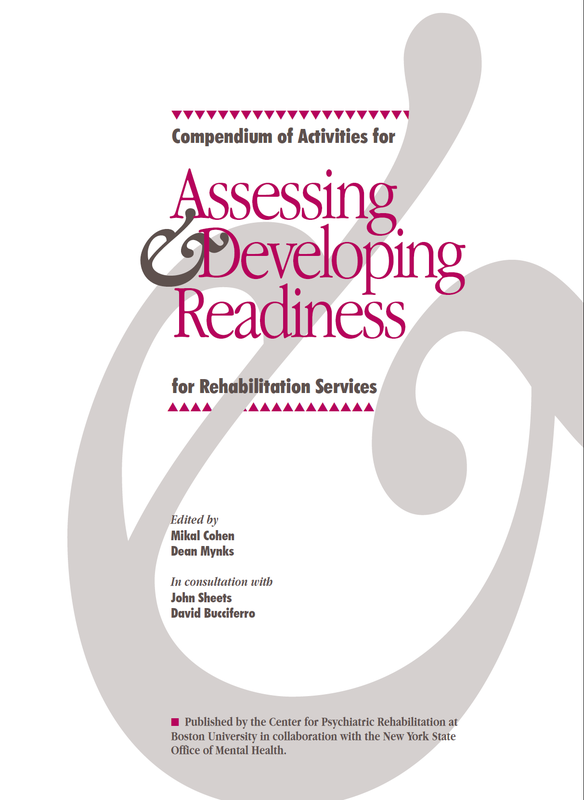 Compendium of activities for assessing and developing readiness for rehabilitation services. Boston: Boston University, Center for Psychiatric Rehabilitation. Mikal Cohen, PhD, was associate executive director at the Center for Psychiatric Rehabilitation and research associate professor of rehabilitation counseling at Boston University. Dr. Cohen developed psychiatric rehabilitation and case management training technology and wrote numerous journal articles, books, book chapters, and monographs. John L. Sheets, MSW, MPH, is a consultant in psychiatric rehabilitation services design from Syracuse, New York. Mr. Sheets worked for years as the Director of the Recovery and Rehabilitation Services Unit in the Adult Community Care Group of the New York Office of Mental Health in Albany, New York. Mr. Sheets co-authored numerous articles on the integration of psychiatric rehabilitation services in state systems and behavioral health care. David Bucciferro, BS, is the Director of the Rehabilitation Services Unit in the Adult Community Care Group of the New York Office of Mental Health. Mr. Bucciferro collaborated with Boston University’s Center for Psychiatric Rehabilitation in training projects across the state of New York. As a result of the many years of working together, this Compendium of Activities for Assessing & Developing Readiness for Rehabilitation Services was developed as an outcome of the training projects. More recently, Mr. Bucciferro has been a leader in developing and implementing the Personalized Recovery Oriented Services (PROS) initiative for the state of New York, which is a licensed outpatient mental health program for adults that offers a customized menu of recovery-oriented services provided in both centralized locations and in natural community settings where people live, learn, work, or socialize.